The college lacrosse Final Four Championship weekend will be back once again, hosted by your New England Patriots and Gilette Stadium. The crowds were so big in Foxboro that the NCAA awarded the games once again to New England. 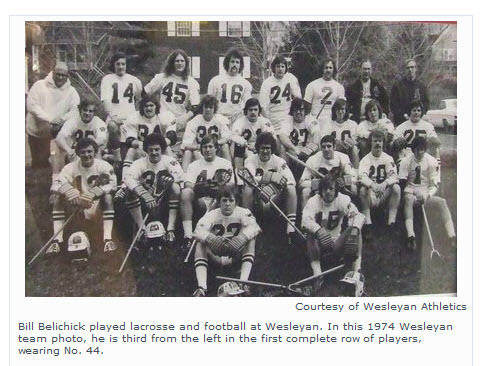 Patriots Coach Bill Belichick played college lacrosse and football, and is a big supporter of Gillette hosting the Championships. In what has become an annual tradition of sorts, New England Patriots coach and avid lacrosse fan Bill Belichick took a few moments during his conference call with Baltimore media to talk lacrosse. Belichick, who spoke while preparing for Sunday’s showdown between the Ravens and the Patriots, is very tight with Johns Hopkins coach Dave Pietramala. So it’s no surprise that Belichick is eagerly anticipating the upcoming season. "It looks like there’s a lot of good teams in lacrosse this year," he said. "So I’m sure it’ll be very competitive. There will be all the usual big names, but it seems like there’s always a couple teams that get into the mix. Hofstra had a great year last year and Villanova and teams like that that people weren’t talking about a lot at the beginning of the year but showed up at the end. It’s always interesting." Belichick admired Notre Dame’s run to the national title game, especially after he watched the Fighting Irish’s 10-8 home loss to Rutgers on March 27. That setback began a three-game skid for Notre Dame and nearly jeopardized the team’s hopes for a berth in the NCAA Tournament. But they recovered in grand fashion, upending higher-seeded opponents in Princeton, Maryland and Cornell before falling to Duke in the championship final. "Coach [Kevin] Corrigan did a great job at Notre Dame," said Belichick, whose son Stephen is a junior defenseman for the Scarlet Knights. "When I saw my son’s team, Rutgers, beat them out there, they sure didn’t seem like a national championship contender at that point. But they just got better with each game, and they really played great down the stretch, and that’s when it counted. They got some great goaltending and big plays out of their midfield. So it was a terrific game, and it was a big win for Duke after they had been so close. So it was great for lacrosse." The sport took a little bit of a bum rap when several fans complained that Duke’s 6-5 overtime win against Notre Dame wasn’t explosive enough and lowered the game’s high-octane reputation a notch. Belichick, a defensive guru with teams like the New York Giants, Cleveland Browns and Patriots, didn’t seem to mind. "I love a good defensive game," he deadpanned. Paul Rabil was busy in New England this weekend teaching a couple youth lacrosse clinics, but he was sure to leave some time for fun. After watching the Patriots beat the Colts at Gillette Stadium, Rabil took to the field with Belichick...to play some lacrosse. 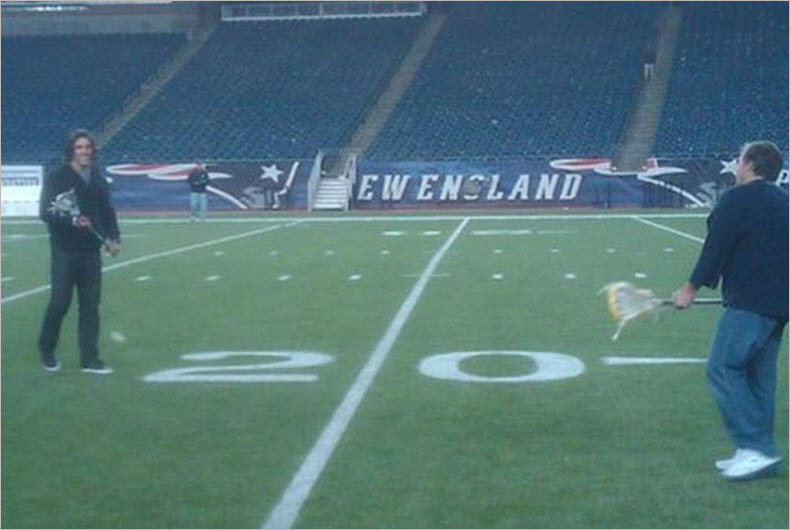 Belichick keeps his stick in his office, so after the post-game press conference he was ready to celebrate the big win with a relaxing game of catch. Rabil proved he can throw the ball as long as his shot is fast, launching the ball the entire length of the field to Belichick.